Four foundation repair mistakes that property owners make can be avoided. A little foundation maintenance can help protect your property from the need for foundation repair and the accidents that create the need for it. Stop problems. To halt trouble and eliminate errors, read the following list of things that lead to the causes of foundation problems in Texas. Protect your property. Not contacting a contractor as soon as you detect foundation issues. Because Dallas / Fort Worth property owners frequently have problems, you should contact a professional as soon as you see trouble. Because foundation damage is progressive, it’s a mistake not to contact an expert who is qualified to help. If you’re a property owner, you’ll want to get information that stops damage right away. It’s best to consult with a foundation repair contractor and have them inspect your property as soon as you see any indications of damage. People accidentally forget to do things that are helpful. Signs of foundation issues include: foundation cracks, brick veneer cracks, a cracked chimney, flooring that’s not level, and windows and doors that do not align properly. Once the foundation repair contractor has evaluated your property, you will have better idea of what needs to be done and, if you require foundation piers, how many are needed to rectify the problem. Planting trees and large shrubs too close to your foundation. Everyone loves tree and nice foliage however, planting it right next to your foundation or just a few feet away can be a major error that damages your foundation. That’s because plants and trees need moisture to live and they have roots. As the roots develop and get larger, they will crawl deep under your foundation and slowly draw all the moisture into their root system, leaving the soil around your foundation dry. Letting that happen is a mistake. The soil around your foundation should never be allowed to get too dry, because that will cause the soil to contract and will eventually leak to cracking and more. In addition, the tree roots themselves can get very large and push your foundation in an upward motion, causing it to move or crack. Not maintaining a consistent moisture level around your foundation. This is a common error that property owners frequently make. We are always telling property owners that it is critical that they not allow their Dallas / Fort Worth property to dry out. Ensuring that it doesn’t requires implementing some sort of moisture control program, such as running a basic soaker hose around your foundation periodically to ensure that the soil is slightly moist. Ask a foundation repair contractor what to do about these problems. While you don’t want the soil ultra wet, you certainly don’t want the soil around your foundation to get extremely dry like it does in the hot summer month. Remember: When soil gets dry, it contracts and shrinks. Then, when it gets very wet, it expands and gains volume. This constant expansion and contraction of the soil commonly leads to foundation failure. 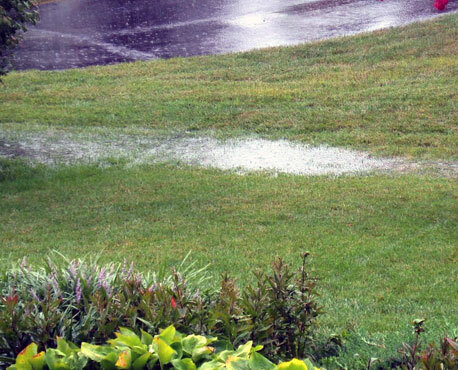 Not having adequate foundation drainage around your property. Having too much water around your foundation can be just as bad as not having enough. People accidentally neglect to do this all the time and it harms their foundation. We frequently see properties that have a tremendous amount of moisture under them and need a foundation drainage system. That’s because the soil around the property is not on a proper slope and/or the homeowner is not using gutters to make sure that water is directly away from their property. To prevent excess water from accumulating under your foundation, you may need a contractor to install a surface or sub-surface foundation drainage system (like a French drain) around your home. It also pays to install gutters. To avoid these mistakes and be a proactive property owner, take steps to ensure that your foundation is secure. If you think you may have damage, schedule a free foundation estimate online.